Cancer may result from genome instability in somatic cells and/or acquired mutations in DNA repair genes. The DNA repair pathway is exceptionally important to prevent DNA breaks during normal replication and to remove DNA lesions after damage has occurred. Defects in combinations of DNA repair genes represent a double-edged sword that either enhances cell sensitivity or generates resistance to DNA damage agents, as in some cancers. 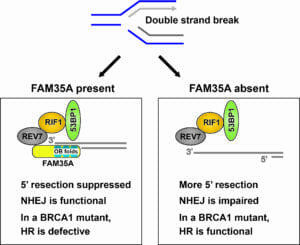 Influence of FAM35A on end resection: During DNA replication, exposure to chemotherapy drugs such as camptothecin or PARP inhibitors can block replication forks, sometimes producing a one-ended double-strand break (DSB). 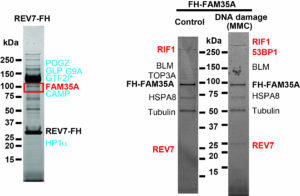 FAM35A, in concert with REV7, RIF1, 53BP1, and other proteins, is proposed to be involved in suppressing the resection at a DSB that produces 3’ single-stranded DNA. BRCA1-negative cells are unable to counter the inhibition mediated by this protein complex, resulting in cell death. 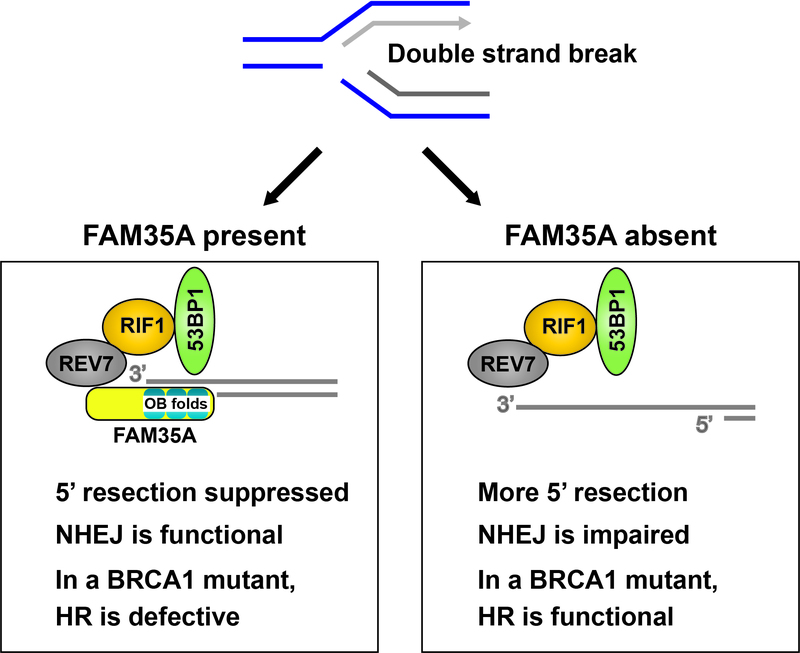 In FAM35A-defective cells, 5’ end resection can occur even in BRCA1 mutants, activating homologous recombination. This may be one mechanism of acquiring resistance to PARP inhibitor in BRCA1-mutant cells. However, excessive end resection can block the action of NHEJ. As an OB-fold protein, FAM35A may interact with single-stranded DNA and then block nucleases or interactions with other proteins. Our laboratory is working to define mechanisms of chemoresistance in prostate, breast, and ovarian cancers using approaches in biochemistry, protein complex (my favorite experiment), cell and molecular biology supplemented by newly available genome sequencing data (e.g. 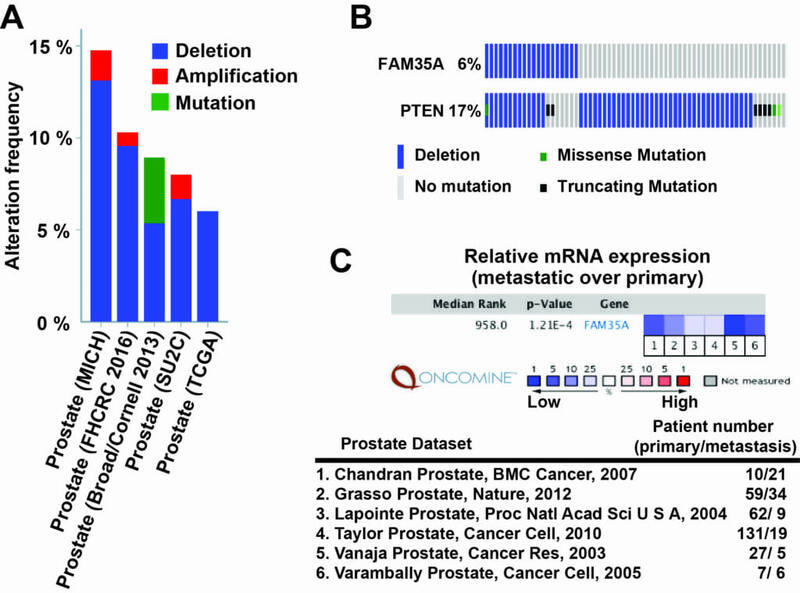 TCGA and ONCOMINE). REV7 complex (left): I found FAM35A protein ID in 2011. 🙂 From this time, FAM35A has been a big, exciting mystery! FAM35A complex (right): These results opened my new scientific direction! Reference: Tomida J, Takata K, Bhetawal S, Person MD, Chao HP, Tang DG, Wood RD. FAM35A associates with REV7 and modulates DNA damage responses of normal and BRCA1-defective cells EMBO J. 2018;37(12):e99543.